Do you enjoy watching the birds as they choose your birdhouse to begin their new family? Do you enjoy relaxing outside while watching the birds gather nesting materials to build their nest? Would you like to see even More? Well, Now You Can! A Great Gift Idea For A Birdwatcher Too! What's Happening Inside Your Bird House? Imagine listening and watching everything that is going on inside your birdhouse. No longer will you need to be content just watching birds going in and out of the house, now you can see and hear all that is happening on the inside, All From Your Favorite Chair! Watch as mom or dad incubate and turn the eggs. See the little babies as soon as they break through the shell. Hear the tiny chirps as they first begin to beg for food. Watch as the nestlings attempt their first flight out of the nestbox. Catch the sights and sounds of wild bird activities - day and night - with the Hawk Eye Nature Cam. Ideal for viewing all the activity inside a nest box or at your bird feeders. View both day and night activities. During the day, the camera sends real-time color video and sound to your television or computer. At night, Hawk Eye's infrared lights take over. Imagine being able to turn your television or computer into your very own front row seat to the nesting, incubating, and raising of young birds theater. You can, with the Hawk Eye Bird Cam. For years this technology was out of reach for the average birdwatcher. Not anymore. Now anyone can get the Hawk Eye Bird Cam complete with built in microphone, 100 feet of AV cable, and all ready to be plugged into the back of your TV or computer. Need more than 100 feet of cable? Order another 100 feet when you check out! The birdhouse cam works using invisible infrared light, allowing you to see the goings on all day and night. What better way to get children interested in nature and birds. Imagine charting the progress of the happenings in your birdhouse with your children. Great for home schoolers. Days of nest building, and materials used. Feeding Trips - And what kind of food. The list is endless. It's a great way to monitor your backyard Bluebird house or Purple Martin Colony. What greater way to say you care than giving the Hawk Eye Bird Cam to a bird lover who is home bound. An investment that will bring season after season of joy in any birdwatchers life. Whether it's You, your children, grandchildren or a special friend, All will get years of enjoyment and memories that can last a lifetime. If you love birdwatching, or know someone who does, you've got to get the Hawk Eye Bird Cam. Use the Hawk Eye Bird Cam year around. Mount it next to your hummingbird or sunflower seed feeders and never miss a minute of the action. All without being glued to the window. 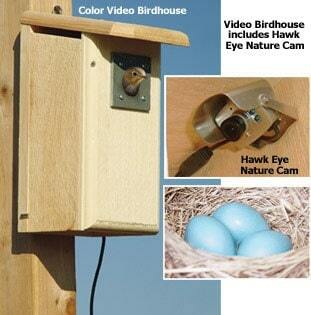 Simply mount the Hawk Eye in a nest box, next to a feeder, or anywhere you want to watch wildlife. Run the Hawk Eye's 100 ft cord into the house, plug it into the television, and then sit back and prepare yourself for the surprising beauty you catch on camera. Don't let another season pass by without having your own Hawk Eye Cam.